80% of respondents said they would want it to return next year, 0% said no, 20% were indifferent. There is no doubt thousands of people flocked to the festival and it would be nice to see the figures on how many people bought tickets for the icerink and for the big slide. It would also be good to see a survey of the food stalls to find out if it was a financial success for them as well. I liked the Winter Garden festival but would love to see some real snow there and the lay-out should be changed to make it more cohesive. The food stalls were too far away and the events at the teepee should have been to the south of the icerink closer to the slide. 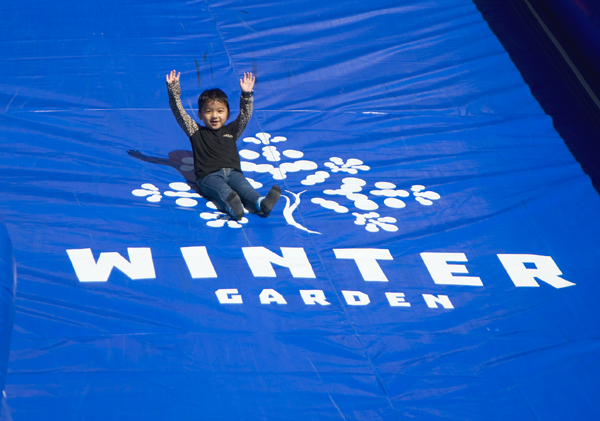 I hear the City is considering putting the Winter Garden in the carpark near the Youth Plaza next year because of problems with flooding of the area where the festival was held this year. Retail expert and former shopping centre manager Colin Nichol has written an article in support of pop-up retail shops on the Fremantle Tribe blog- http://fremantlesociety.org.au/blog. Colin writes that pop-ups are there to stay as the new face of retail and that they are Freo’s future. He rightly argues that they are a low-risk way to try the viability of a new small business. While trendy placemakers will want us to believe that pop-ups are a new modern and creative way to do business, pop-ups have been around for centuries in the form of markets. Markets are very much pop-up businesses where people do not have the money to sign expensive leases in shopping areas, or where they only want to open shop on certain days of the week. Markets all over the world have been incubators for small businesses forever and it has given many people the confidence to move on and open more permanent shops. In third world countries pop-up shops happen daily with someone selling ten pieces of firewood on the street while someone else has nicely arranged nine tomatoes or potatoes for sale at a roundabout. In the western world markets have become more and more popular, as we see in Fremantle where we now have a Wednesday, Friday, Saturday and Sunday market, plus the almost daily Kings Square market and the weekend Fremantle and E Shed markets. Our Freo markets mainly have a community focus, a place for people to relax while browsing for food and other things. They offer opportunities for local musicians to be heard and seen, and they attract people to often under-utilised areas of the city and create new vitality in those places, as we witness at the Growers Green and Princess May Markets and Bathers Beach. There are people who argue that markets and pop-ups are unfair competition to those retailers who pay high rents to have a shop, but I believe it is a choice people want to have. Many people dislike shopping in sterile shopping centres and supermarkets. They want the relaxed open-air community experience where they can catch up with friends while buying their healthy-often organic-groceries and other things. People love markets because it is their lifestyle and they feel at home there. There is a true sense of belonging in community markets around Fremantle, and what a great way to support local small businesses from the area.